Black-and-white linocut prints of geometric and abstract motifs, textual patterns, masks, and mythical figures provide a pictorial presentation of African designs. These 378 linocut prints in crisp black-and-white designs reflect traditional work from Zulu, Masai, and dozens of other tribes. This pictorial archive includes masks, abstract motifs, and much more. 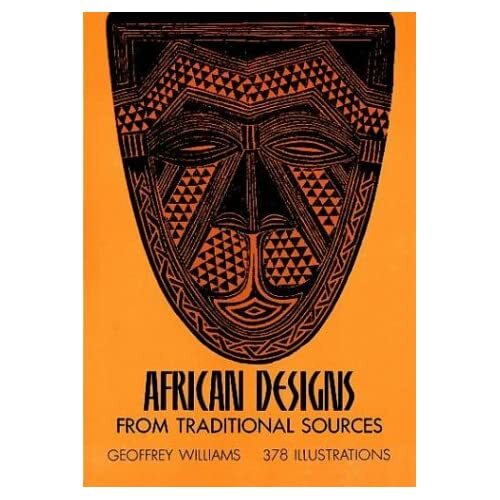 Published in 1971, this book is a pictorial archive of African design. Taken largely from carved art in wood and stone, most of the designs are presented as black and white linocut prints, and each design includes a brief description of its geographic and tribal origin. A map of Africa is included as well as source references from museums, collections and publications for each of the artifacts that the designs have been extracted from, more than 200 in all. This is an excellent resource for artists as well as school age children and it is an exceptional value. I'm holding out on that last star only because no dates are given for the works cited.